It's been a part of our routine for as long as I've been a Neopian: every day one of my pets and I stop by the Island Mystic's Hut to get our daily fortune. When I began visiting, it was in hopes of hearing a fortune that included Kyrii; I'm an avatar collector. Now I stop by more out of habit that anything. For the kids—Albert_D_Fluffmeyer, Grufphey and Susie_Q_Fluffmeyer—it's a still a pretty big deal, each for their own reason. Susie, who's never quite recovered from being a Darigan JubJub, hopes she will receive a fortune that will let her to do something I wouldn't otherwise allow: You suddenly realize all the plushies in Neopia belong to you, or maybe You will find the deed to Dr. Sloth's secret lair at the slushie shop. Fortunately she's never gotten either of those, or I'd be spending all of my time returning plushies to their rightful owners and dragging her away from the counter at the Slushie Shop. Grufphey, who works as a part-time agent with the Defenders of Neopia, uses the Mystic's predictions as a sort of neighborhood watch. 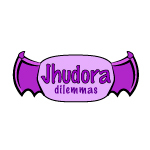 You will be attacked by a herd of three-headed Zafaras will have him hurrying to the armory and strapping on battle gear before I can even mutter, "Oh Jhudora, not again." Now that I think of it, he's probably hoping to find the deed to Dr. Sloth's secret lair, too, so he can take the good doctor into custody. But as seriously as Grufphey and Susie take the Mystic's pronouncements, it's nothing compared to my JubJub, Albert. As far as Albert's concerned, if the Mystic says it, then it's gonna happen. You will lose your favorite hat to a flock of mutant Shoyru, the Mystic warned him, and now his hat is missing. Did he see the mutant Shoyru take his hat? Well, no, but he explained that mutant Shoyru are probably pretty sneaky if they go around taking a fella's hat, so naturally they wouldn't take it when he was paying attention. In the beginning, Albert wasn't one of the Mystic's true believers. He was young, and glowing Sloth minions or rabid flying Myncies didn't seem very likely to him. I remember the day that changed. With a generous amount of faerie dust to facilitate matters, Albert and I had traveled around Neopia, collecting omelettes, postulating the existence of a land made entirely of jelly, spinning wheels in hopes of winning untold riches. Our last stop was the Island Mystic's Hut, and we were running a bit behind schedule because Albert had tried to talk the Tiki Tack Man out of his mask again and that's not the sort of thing that can be rushed. There wasn't a crowd around the hut so we quickly went inside. As we stood in the doorway waiting for our eyes to adjust to the gloom, the Mystic went into his act. Chanting rhythmically he danced around the small room, shaking a brightly colored rattle. A rattle, I couldn't help noticing, that looked a lot like a Hikalaka Maraca. Suddenly he leapt into the air and landed directly in front of us. Staring fixedly at the thatched wall behind us, the Mystic intoned, "Your ability to hop will cease unexpectedly." My first thought was disappointment, still no Kyrii; I was never going to get that avatar. As the Mystic turned and disappeared behind a curtain of strung shells Albert and I left the hut. Worriedly, Albert looked up at me. "That was just pretend, right Mama?" Solemnly, without speaking, I jumped over a shell lying in the path before us. Albert giggled and jumped high into the air. "Just pretend," he said contentedly. The rest of our day passed quickly; we played Cheeseroller, then several games of Turmac Roll and Bouncy Supreme, finishing with a Stowaway Sting tournament, Obviously, our ability to hop was crucial in each of these games and had we lost it we would have noticed immediately. Our hopping skill remained intact, however, and was amply demonstrated by my energetic JubJub as he hopped and skipped down the path toward our neohome. Upon entering the house, Albert ran down the main hall yelling, "Hey, Grufphey, guess what? Hey, Grufphey, where are ya?" 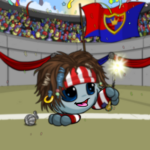 Finally he found Grufphey in the playroom with Spin_Dizzy, a Tyrannian Quiggle I had adopted and was zapping. (This all happened before Susie joined the family.) The two had been playing a quiet game of Cheat! until they were interrupted by their noisy brother. "Hey Grufphey, I gotta ask you sumthin. It's really important." Grufphey lay down his cards and looked seriously at Albert. "Aw rite, Albert, whacha want?" Puzzled, Grufphey studied his brother. "Well, yeah, Albert. I reckon I can." "Show me!" Albert demanded. Grufphey shrugged, stood up, and jumped a few inches into the air. When he landed, the windows in the playroom rattled. (Grufphey, in case I forgot to mention it, is a Tonu.) Albert turned to Spin_Dizzy, "Diz, can YOU hop?" Diz, as I mentioned, is a Quiggle. He stood and stretched his legs, and then, getting into the spirit of the moment, he leapt. He jumped. He capered about. Spin_Dizzy could, indeed, hop. As I headed to the kitchen to fix supper for my acrobatic family, Albert explained about the trip to Island Mystic, the fortune we had been given, and how the events of the day had proven the Mystic to be completely wrong. Supper proceeded with no more than the usual number of messes and mishaps. JubJubs and Tonus are not the most fastidious of eaters, lacking thumbs as they do. Spin_Dizzy, though adept with spoon and fork, seemed especially troubled by the idea of not being able to hop and repeatedly left the table to reassure himself that he had not lost the ability. Grufphey tried to comfort him, "It's aw rite, Diz. That ole Mystic dinut mean you'd lose yer hop. Only Albert n Mama wuz there, so it's gotta be one o them. I reckon he meant Mama, anyway, 'cause she kinda old." I struggled to hide my laughter as I cleared the table, sending the boys upstairs to do their homework and get their baths. "Remember," I warned as they headed up the stairs, "the fortune was about hopping, not diving or swimming, or splashing water on the bathroom floor. No reason to test if those abilities still function." "You can trust me on this, boys; I'm quite certain. And I should know; after all, I'm old." Faced with that irrefutable fact, they stopped protesting and headed upstairs. Hopping and jumping. Just in case, I suppose. Later that night, when the sounds of bathtub drains gurgling and little boys giggling had finally stopped, I set out milk and cookies at the kitchen table. Snacks just before bed are rare, but the idea of losing one's jump was apparently very upsetting to young neopets, and I felt they deserved a special treat. "Albert! Grufphey! Spin_Dizzy! Snack time!" I braced myself for the stampede. In short order Grufphey and Spin_Dizzy came charging down the stairs and into the kitchen. Quickly they slid into their seats at the table. "Where's Albert?" I asked. "He's comin'," Grufphey replied, picking up a cookie. "He hadta find his slippers." "Well, put the cookie down. Let's wait until he gets here to start eating." Grufphey gave me a look that said that was the silliest thing he'd ever heard, but obediently put the cookie down. "Hey, Albert, hurry up! We're waitin on ya!" he yelled. Sighing, I shook my head. Good manners don't stand a chance against cookies. To his credit, Grufphey shot me an apologetic look and mumbled, "Sorry, Mama. I'm just hungry." I reached out and ruffled his mane, "I know, Grufphey. Just don't yell again. You'll wake King Skarl, and he'll be grumpy." Grufphey chuckled, "King Skarl's always grumpy, Mama." "I'm not yelling, Mama," Spin_Dizzy piped up. I reached out and patted his shoulder. "I noticed that, Spin_Dizzy. Thank you." We sat for a few minutes, eying the cookies and waiting on Albert. I began to be concerned. Albert isn't the sort to miss any snack, especially milk and cookies. I wondered if there was prank in the works. I considered asking Grufphey, but after watching him fidget I decided that his impatience was due to cookie deprivation, not anticipating one of Albert's schemes. It was time to check on my wayward JubJub. At the top of the stairs I called out, "Albert? Where are you, dear?" A small, sad voice answered, "I'm in my room, Mama." I hurried down the hallway to his bedroom, and saw Albert standing by the foot of his bed, his white bathrobe around his feet. I heard sniffles. "Albert, what's wrong?" Slowly Albert raised a tear-stained face to me. "That dumb ole Mystic was right. I can't hop no more, Mama. I can't even walk!" I went to him, intending to pick him up and discover the cause of this sudden immobility. For a moment there was resistance, and then with a sudden, squelchy noise he pulled free. "What in Neopia--!" I muttered as I looked down. There, in the puddle of white terrycloth, were his new slorg slippers, slime coated and stuck very firmly to the floor!